The global market for piperonyl butoxide (PBO) is rather consolidated and is primarily driven by the ever increasing demand for food. The rapid increase in the global population has raised food security concerns and several underdeveloped and developing countries still lack proper infrastructure for the storage and distribution of food grains. A significant rise in yield is possible through the usage of crop protection chemicals such as insecticides. This has resulted in the high demand for piperonyl butoxide. In terms of revenue, the piperonyl butoxide market was valued at US$10.02 mn in 2015 and is projected to reach US$15.45 mn by 2024, expanding at a steady CAGR of 5.0% from 2016 to 2024. The demand for PBO, on the other hand, is likely to increase at a CAGR of 3.9% during the forecast period. The key applications of piperonyl butoxide include pyrethrin, pyrethroid, carbamate, rotenone, permethrin, bioallethrin, deltamethrin, and bioresmethrin. Carbamate constituted the leading share in the piperonyl butoxide market in 2015, followed by pyrethroid. These two segments cumulatively accounted for a share of over 75% in the PBO market in 2015. Carbamate, pyrethrin, and pyrethroid are part of a relatively newer generation of insecticides. Pyrethrin and pyrethroid insecticides are currently preferred by farmers for their lower and toxicity. Carbamate is the key revenue generator as well as the key consumer of piperonyl butoxide. Derived from carbamic acid, carbamate is used to control or kill insects and finds application in the agriculture sector as well as in homes. The growing usage of insecticides for crop protection and the rising demand for food are likely to boost the demand for carbamate in the coming years. The Asia Pacific PBO market is segmented on the basis of geography into China, Japan, India, ASEAN, and Rest of APAC. China accounted for the leading share in the piperonyl butoxide market in 2015, accounting for a demand share of more than 45% that year. The growing usage of insecticides for crop protection in the county, coupled with the rising demand for food, is likely to boost the demand for piperonyl butoxide in China. China is not only the leading revenue generator and consumer of PBO, but the country is also expected to expand at the fastest pace over the course of the forecast period. Japan and India are also prominent markets for piperonyl butoxide in Asia Pacific. In addition to these, Bangladesh and countries in Southeast Asia have been experiencing a strong demand for crop protection chemicals since the past few years. This is anticipated to boost the demand for piperonyl butoxide during the forecast period. Key players operating in the piperonyl butoxide market include ENDURA P.IVA, Sumitomo Chemical Co., Ltd., Wujiang Shuguang Chemical Co., Ltd., Tokyo Chemical Industry Co., Ltd., Alfa Aesar, Capot Chemical Co., Ltd., Hem Corporation, Shanghai Skyblue Chemical Co., Ltd., and Zhejiang Rayfull Chemicals Co., Ltd. The report analyzes and forecasts the piperonyl butoxide market on the regional level. The study provides historic data of 2015 along with forecast from 2016to 2024 based on volume (tons) and revenue (US$ thousand). The study provides a decisive view of the piperonyl butoxide market by dividing it into application and regional segment. Application segments have been analyzed based on current trends and future potential. Regional segmentation includes current and forecast demand for piperonyl butoxide in Asia Pacific. The region has been further sub-segmented into countries and sub-regions with relevance to the market. Segmentation also includes demand for individual application type in the region. The study covers drivers and restraints governing the dynamics of the market along with their impact on demand during the forecast period. Additionally, the report comprises opportunities for the piperonyl butoxide market on regional level. The report includes detailed value chain analysis to provide a comprehensive view of the piperonyl butoxide market. Analysis of Porter’s Five Forces model has also been included to help understand the competitive landscape in the market. The study encompasses market attractiveness analysis, wherein applications have been benchmarked based on their market size, growth rate, and general attractiveness for future growth. The market has been forecast based on constant currency rates. Prices of piperonyl butoxide vary in each country and depend on the demand-supply scenario. Hence, a similar volume-to-revenue ratio does not follow for each individual country. Individual pricing of piperonyl butoxide for each application has been taken into account while estimating and forecasting market revenue on the regional level. Regional average price has been considered while breaking down the market into application segments in each country. The report provides the size of the piperonyl butoxide market in 2015 and the forecast for the next eight years. Numbers provided in the report are derived based on demand generated from different applications. Market estimates for this study have been based on volume, with revenue being derived through regional pricing trends. Prices of commonly utilized grades of piperonyl butoxide in each application have been considered, and customized application pricing has not been included. Demand for piperonyl butoxide has been derived by analyzing the regional demand for piperonyl butoxide in each application. 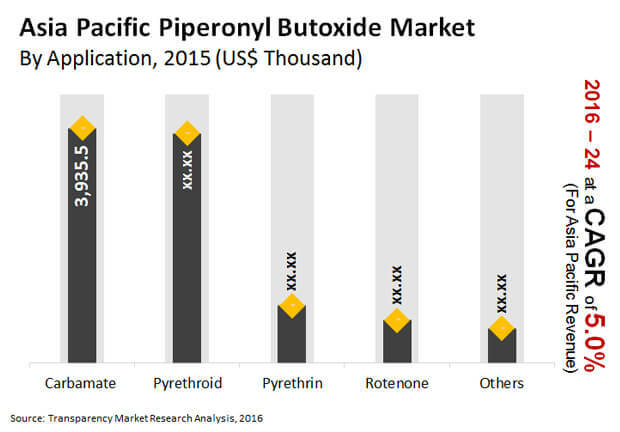 The piperonyl butoxide market in Asia Pacific has been analyzed based on expected demand. Market data for each segment is based on volume and corresponding revenue. Prices considered for calculation of revenue are average regional prices obtained through primary quotes from numerous regional suppliers, distributors, and direct selling regional producers based on manufacturers’ feedback and application requirements. Forecasts have been based on the estimated demand for piperonyl butoxide in different applications. The regional application segment split of the market has been derived using the bottom-up approach, which is cumulative of each country’s demand. Regional demand is the summation of sub-regions and countries in the region. Companies were considered for market share analysis based on their end-user portfolio, revenue, and manufacturing capacity. In the absence of specific data related to sales of piperonyl butoxide by several privately held companies, calculated assumptions have been made in view of companies’ application portfolio and regional presence along with demand for piperonyl butoxide in different applications in their portfolio. The report covers detailed competitive outlook that includes market share and profiles of key players operating in the Asia Pacific market. Key players include ENDURA P.IVA, Sumitomo Chemical Co., Ltd., Wujiang Shuguang Chemical Co., Ltd., Tokyo Chemical Industry Co., Ltd., Alfa Aesar, Capot Chemical Co., Ltd., Hem Corporation, Shanghai Skyblue Chemical Co., Ltd., and Zhejiang Rayfull Chemicals Co., Ltd. Company profiles comprise attributes such as company overview, brand overview, financial overview (in terms of financial year), business strategies, and recent/key developments.